Welcome to the Children’s Garden! Well, maybe we’re not friends yet–let me introduce myself! My name is Desi, I live in Chicago, I’m a grad student/writer/amateur gardener, and I love cheese. 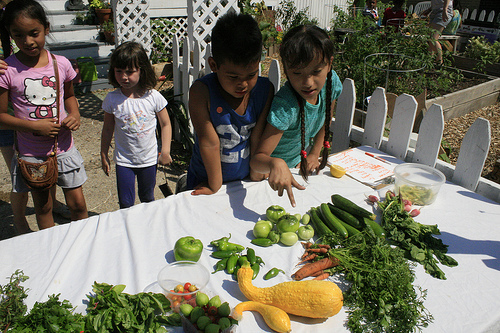 This is my first year at Summer of Solutions, and I’m proud to be one of the teachers of the Children’s Garden Class. As I watched the snow fall outside my window yesterday, it was hard to believe that summer is right around the corner. But you better believe that it’s coming, and the time to figure out your summer plans is NOW! Summer is a critical time to build and strengthen the movement, and luckily there are tons of opportunities to get involved in the youth climate movement this summer! Check out our Summer Opportunities page to find out what’s going on across the movement! Many application deadlines are approaching soon! Want to change the world? Don't know where to start? It's ok, we've all been there before. Personally, I felt that way for most of my life until just a few months ago. I discovered a program called the Greenpeace Semester, applied, got accepted, and headed out to Washington D.C for nearly six weeks this past summer. Truthfully, I had little idea of what to expect. As a student interested in environmental policy, the buzz words Greenpeace and Washington D.C. initially lured me into what was the best experience of my life. Want to learn organizing strategies to challenge corporate power on your campus? Stay up late talking about revolutionary possibilities with student activists from all over the country? Learn about your endowment in order to shift the power at your school? Then the Responsible Endowments Coalition Summer Organizing Retreat is for you! With recent news that utilities will transition off ten more coal plants, US activists can claim to have put 100 aging, dirty coal plants on the path to retirement. This is a milestone in what is becoming one of the most successful environmental campaigns in history: the push to clean our air and slash carbon emissions by phasing out the US coal fleet. We’ve won victories of mammoth proportions. Now it’s time to make sure these wins are not undermined, and that coal kings don’t simply export their dirty product abroad. This won’t be easy, because they are even now pushing plans to ship coal from the Powder River Basin and other areas overseas. As a movement committed to the dream of clean power for all, we cannot let them succeed. Build the Green Economy this Summer! Grand Aspirations empowers, connects, and supports youth leaders as they create innovative, self-sustaining, and inter-dependent initiatives that systemically integrate climate and energy solutions, economic security, and social justice. People are solutions. In every community, people hold the ideas and inspiration for change, and we believe in them as we believe in ourselves. We are a force for change, a force that can transcend the old energy paradigm to build the present and future that we know is possible–one that is both equitable and sustainable. Our social, economic and environmental problems will be solved creatively by drawing together resources, forces, ideas and energy from many different people and places.